In fact, oral cancer kills more people than cervical cancer, brain cancer and testicular cancer each year and is seldom mentioned. Each year, over 30,000 Americans will get oral cancer, and unfortunately, only 57% of these people will survive for more than five years. Late stage oral cancer has around a 15% survivor rate at five years. Dr Mark and Ellen McOmie are engaged in the fight against oral cancer and are determined to do all they can to help; this is why they incorporate the Velscope in their dental practice. It helps them catch oral cancer early, early stage oral cancer has an 85% cure rate. Early detection is the key. Low-grade oral cancers are more easily treated late stage oral cancer treatment much more complicated. Even if you don’t smoke, use chewing tobacco or use alcohol you still need to get tested. Tobacco and alcohol use does contribute to oral cancer; however, 25% of those diagnosed refrains from both substances. 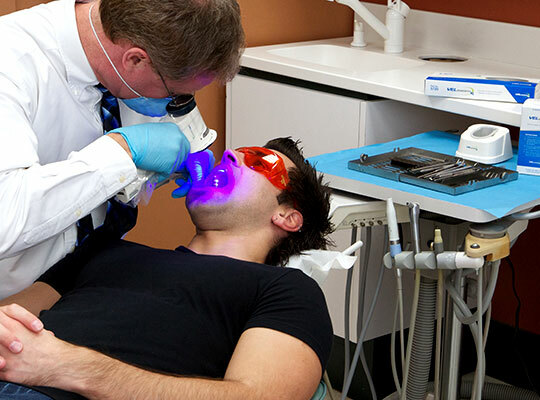 Annual oral cancer screenings are the best way to stay protected from oral cancer. 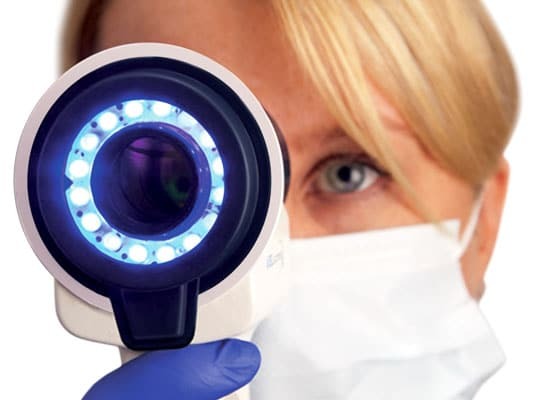 We perform an oral cancer exam during your regular dental checkup using an FDA-approved VELscope to help detect oral cancer in its earliest stages. McOmie Family Dentistry is one of the few dental practices to employ this powerful diagnostic tool. The VELscope highlights precancerous and cancerous cell changes using a blue excitation lamp and allows us to see what is happening beneath the surface. The healthy soft tissue inside the mouth easily absorbs the VELscope frequency of blue light while the healthy areas below the surface appear green, and the trouble areas show much darker. If symptoms are found, we may take a biopsy to determine whether or not it is oral cancer. The results of the biopsy dictate the best course of action from there. If nothing is found we will schedule another oral cancer screening in one year’s time.